Snoring may seem like a fairly trivial problem, but for those who deal with chronic loud snoring night after night, it can really take a toll. The only the time the body is able to heal and repair itself is during sleep. If you or your partner have trouble with snoring and can’t seem to sleep through the night, you may be suffering from sleep apnea, and your health may be at risk. You may be wondering, what can a dentist do to help me sleep better? Hint: more than you might think. 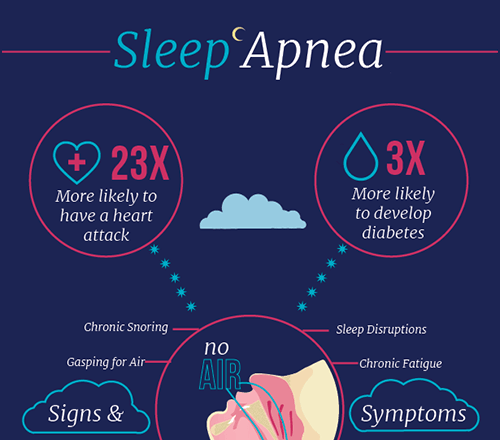 Sleep apnea is a common and dangerous sleep disorder that affects millions of Americans, while many cases remain undiagnosed. Sleep apnea can be tricky to diagnose because symptoms are mostly present during sleep, so many sufferers are unaware of their condition. They feel tired and groggy after what should have been a full night’s rest. They are moody and irritable for no apparent reason and may have a host of seemingly unrelated health problems. They may fall asleep periodically throughout the day and have very little energy. There are three types of sleep apnea: obstructive, central, and mixed sleep apnea. Obstructive sleep apnea occurs when the soft tissues in the back of the throat collapse during sleep, obstructing the airway. Central sleep apnea occurs when the brain’s respiratory control centers do not stimulate the lungs and diaphragm properly during sleep. Mixed sleep apnea is a combo of the two. Central sleep apnea requires the attention of a medical doctor or neurologist, but your Granbury dentist can help treat obstructive sleep apnea and minimize the effects of mixed sleep apnea. There are certain demographics that are at a higher risk of developing sleep apnea and certain lifestyle habits that contribute to the problem. Sleep apnea results in low blood oxygen levels, increasing your risk for serious health problems and a slow deterioration of the immune system. The gold standard for sleep apnea treatment is still a CPAP machine, but many patients find CPAPs intolerable because they require a bulky face mask hooked up a tube that loudly pushes air in and out of the lungs – talk about invasive. Not to mention inconvenient, there’s no easy traveling and especially no camping if you need a bulky machine and an electrical outlet just to sleep through the night. Most patients diagnosed with sleep apnea will try a CPAP and then stop using it, rendering treatment entirely ineffective. In the past, the only CPAP alternative was even more invasive corrective surgery. At Granbury Dental Center, we want to avoid surgery at all costs. Thankfully, with advances in modern medicine and dental treatments, we have a simple, non-invasive solution for you with oral appliance therapy. Oral appliance therapy uses a custom device worn like a mouthguard during sleep. Oral appliances are custom made to fit your unique needs and ensure it fits comfortably in the mouth. Your oral appliance gently shifts the lower jaw forward, preventing the airway from collapsing and allowing you to breathe comfortably throughout the night. Oral appliance therapy is highly effective in treating mild to moderate cases of obstructive sleep apnea without the need for a CPAP or invasive surgery. The device is small, comfortable, and easy to use, allowing you the freedom to travel and fall asleep wherever you lay your head. Oral appliance therapy can help reduce and even stop snoring, which we’re sure your partner and family will thank you for. Treating your sleep apnea today can not only help you and your partner find more restful sleep but can dramatically improve your quality of life and actually prevent the development of serious systemic health problems down the road. It might just save your life. If you have any questions about sleep apnea or would like to schedule a visit with your Granbury sleep dentist – Dr. Bruce Baird or Dr. Jeff Buske at Granbury Dental Center – give us a call at (817) 776-8073 or request an appointment online today!